On December 21, all heck broke loose. Some will remember Hurricane Hazel, and the rains and floods she brought with her dame in 1954. Some will remember the black out of 2003, although thankfully for most, that turned into a summer retreat, and for some, even a celebration of old ways. But all of us will remember the ice storm of 2013. Sadly, not many in pleasant ways. It was called one of the worst winter storms to hit Toronto and the surrounding area, and it proved it mightily. Heavy liquid ice rain, freezing in bitter temperatures on trees, tree branches, and power lines stole power from many in the city for up to nine days, with the odd poor few reporting even longer. In Emery Village, the average outage was three days, as crews hit the streets to tackle the collective damage from the storm itself, and its aftermath. Numbers are still being processed, and in many ways are only available in large ball park estimates. The storm carried Canada’s typical winter weather with the combinations of a warm front from Texas that sat over the New York state area before combining with patterns above Toronto on December 20. The combination of freezing rain and heavy winds saw damage to the urban and rural tree canopies unlike Toronto has had to deal with in the past. Approximately 27 of the GTA regions have applied to the Province to be declared as disaster areas contributing to asks upward of $300 million from the entire GTA for funding relief. More than 600,000 GTA residents were without power at one point from the effects of more than 30 mm of freezing rain. It was a storm that agencies have said will take years to clean up, as a lot of the rehabilitation will be growing again the portions of the canopy that were lost. 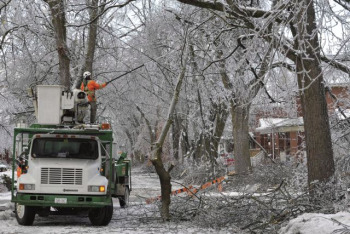 According to reports, Toronto Hydro estimates that $12.9 million has already been spent on the storm, including labor, materials and lost revenue.